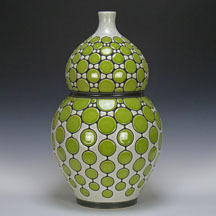 Gregg is a ceramic artist from St Louis, Missouri. 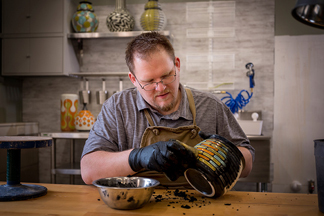 He creates his midcentury inspired work by hand carving the designs into the clay, then he grouts the carved lines after firing to make the bold patterns. 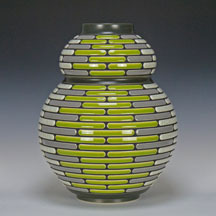 His designs are precise, linear and symmetric. The sharp lines that repeat across his ceramic pieces are purposeful and unhesitating, creating patterns that are as much architectural as they are artistic.